Sunnydale is a Grade II listed cottage, dating from circa 1840. 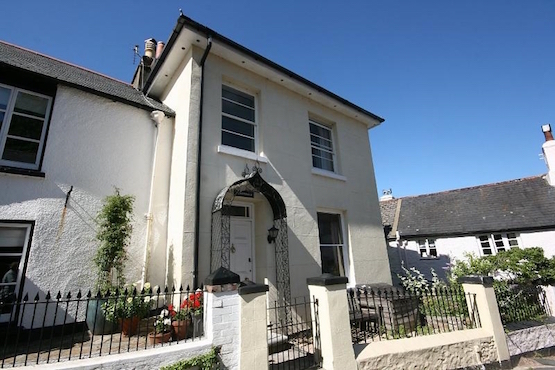 The property is situated less than 100 metres from Dittisham Quay and the River Dart. The modernised accommodation retains period features and oozes character and charm. The bright and spacious double reception room has large sash windows to the front and rear aspects and an attractive open fireplace. On a lower level, there is large kitchen/dining room with wood flooring and exposed timber beams to the ceiling. The kitchen is fitted with a good range of units with wooden work surfaces. In the dining area a wood burning stove set in a stone chimney breast, provides extra heat for enjoying cosy winter meals. On the first floor the two double bedrooms, one of which has lovely river views, both have feature cast iron fireplaces and built-in wardrobes. A cloakroom and bathroom complete the accommodation. To the front of the property there is a small seating area behind a low stone wall with decorative cast iron railings.